How does Quantum entanglement works? 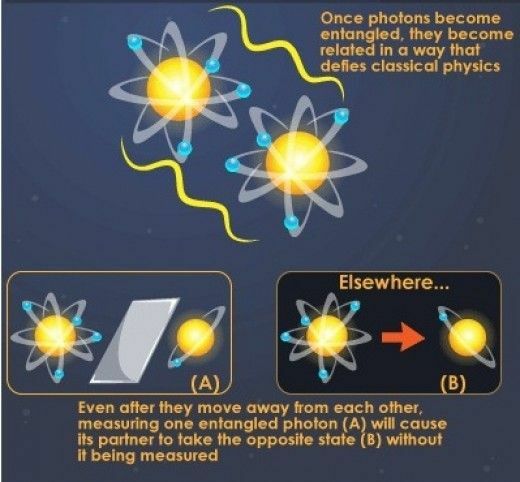 Entanglement occurs when a pair of particles, such as photons, interact physically. A laser beam fired through a certain type of crystal can cause individual photons to be split into pairs of entangled photons. The photons can be separated by a large distance, hundreds of miles or even more. uantum Mechanics is the one of most successful theory ever discovered by physicists and there is no doubt about that, but physicists are still arguing about what it means? What do Quantum Mechanics tell us about the nature of reality? Quantum mechanics make almost the all the stuff of modern age, even the computer or mobile you are using to read this article is the result of quantum mechanics but quantum mechanics is still deeply mysterious. Answers to the basic questions asked by Albert Einstein back in 1920 are still unexplainable.